Manufacturer of a wide range of products which include industrial package drinking water plant, reverse osmosis plant, water treatment plant, water treatment systems and 2000 lph frp ro plant. We are leading manufacturer and exporter of Industrial Package Drinking Water Plant. 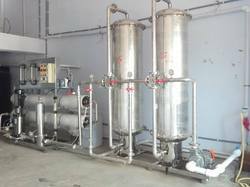 Industrial package drinking water plant is mostly use for drinking water industries.we have set a benchmark in the manufacturing and supplying of Industrial Packaged Drinking Water Plant. We are noted as the best organization engaged in offering high quality Reverse Osmosis Plant. The offered osmosis plant is used to produce high-quality demineralized water. This osmosis plant is developed in adherence to the quality standards by using quality material & advance techniques. Also, our quality controllers check this osmosis plant at various quality parameters to assure a flawless dispatch. We are capable in manufacturing and supplying a wide gamut of Water Treatment Plants. These plants are mainly used for killing germs like viruses, bacteria and fungi. These water treatment plants are based on the latest SAFF. Our range of water treatment plants are manufactured using latest technologies and are featured with user friendly consoles. To retain our goodwill in clients' consideration, we manufacture, distribute and supply a quality approved Water Treatment Systems. Our offered systems are precisely designed using cutting edge technology and optimum quality components in adherence with industry standards. Moreover, we provide these systems from our end after testing them on diversified quality norms. Our valuable clients can avail these systems from us in varied specifications, sizes and designs at affordable prices. All pack engineers is the leading manufacturer for 2000 Liter per Hr FRP Ro Plant. This Plant is regularly use in juice plant and 20 Liter cool jug filling. 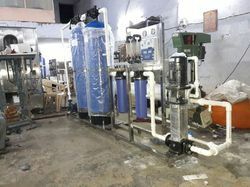 we are providing sand filter, carbon filter, micron filter and membrane.Our 2000 LPH FRP RO Planthave proved to be highly effective in treating brackish or saline water as they involve amalgamation of innovation, technological advancement and unparalleled quality. Additionally, these plants efficiently treat unfit ground water and turn it into quality water that is fit for drinking and also for industrial use. Prices may be vary as per customer requirement.